Filmed in Mexico City, Winnie the Peyotl is a colourful video, for kids aged 3 and up, presenting agitated costumed cartoon characters and religious figures dancing to an electronic cover of a classic merengue track. 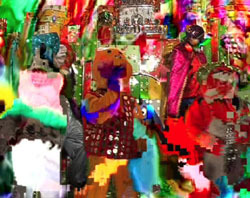 As the original footage is digitally altered, the picture seems to melt, while individual pixels separate and start to create colorful patterns. The video illustrates the experience of grasping the world for the first time and beginning to make sense of it. Antoine Catala is a French artist, born in Toulouse, South of France. His work has been shown at the Musée d'Art Moderne de la Ville de Paris (Paris), Mattress Factory (Pittsburgh), Galerie Christine Mayer (Munich), Karyn Lovegrove Galery (LA), Galeria de Arte Mexicano (Mexico), Fette's Gallery (LA) and Hats Plus (London).